What struck me, most about David Talbot’s history of San Francisco was just how violent the times were. 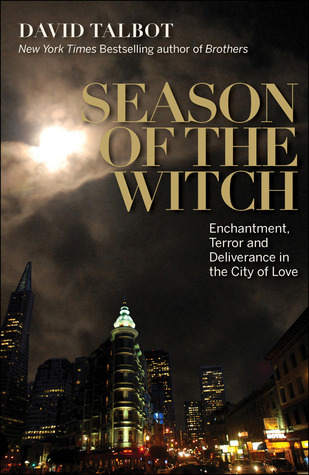 Season of the Witch concentrates on the years between the Summer of Love, 1968, and the AIDS epidemic of the 1980’s. The 1970’s are largely remembered today for disco and very, shall we say, creative fashions but this was a period of violent upheaval in America, certainly in San Francisco. Mr. Talbot explains that in the early 1970’s, during the years that saw the famed Patty Hearst kidnapping, there were multiple attacks on police officers every day. He details one failed car bombing which did’t even make the local Bay Area news since there was no explosion. Bombings without a fatality just weren’t all that unusual in the 1970’s; they certainly weren’t news. I found Season of the Witch very hard to put down, which many people will find unusual in non-fiction. Not only is Season of the Witch non-fiction, it covers a period I lived through–I remember how these stories end–so to say that it’s an exciting read for me really says something. It was also very enlightening; there was so much I didn’t know. Season of the Witch is a portrait of a city and its changing people, but it’s largely a true-crime story. Patty Hearst and the SLA who kidnapped her, the Zebra Killers, the Zodiac, Dan White and Jonestown, not to mention a highly disreputable police force nearly overwhelm the book. But there’s still room for redemption with Herb Caen’s newspaper columns, the rise of the 49’ers football dynasty, Armistead Maupin, gay liberation and the sexual revolution; plenty of very bright spots to provide a light in the darkness. But there sure was a lot of darkness. I had no idea growing up in the East Bay, over the hills in quiet suburban Pleasanton, California. But no wonder my parents were nervous about letting me go to San Francisco State in 1982. That was the tail end of it all, but it was still The Season of the Witch.